Cultural heritage consists in artworks (painting, sculpture…) but also in usual and everyday objects (tools, machines…) sometimes unexpected, such as food preserves. Patented at the early 19th century, cans represent an important technological innovation and one of the symbols of consumer society. They are represented in several museum collections as witness to different time periods and significances. However, their conservation is particularly problematic as severe corrosion phenomena occur due to interaction with environment as well as between the organic content and the metallic sealer. The objectives of CANS are to develop conservation methodologies respectful of the material authenticity and cultural values of these composite objects. proposition of preventive conservation methodologies and possible interventions. 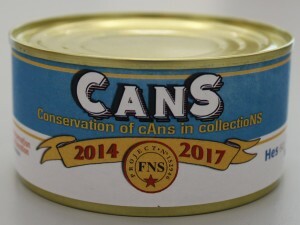 CANS project constitutes an interdisciplinary research that brings together ethnologists, food technology experts, conservators-restorers and conservation scientists (corrosion, material sciences). This project will contribute to the discovering of degradation mechanisms and to the set up of preventive conservation strategies of those objects that are actually part of the cultural heritage.